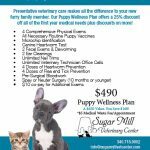 At Sugar Mill Veterinary Center we strive to offer sound client education, and optimal veterinary care with our trained and experienced staff. Our job is not only to treat your pet when he or she isn’t feeling well, but also to promote general wellness care to keep your best friend happy and healthy for years to come. Dr. Stacia Jung was voted best veterinarian on St Croix, VI in 2015.